Wow. And if part of me feels compelled to take issue Labriola’s harshness, I’m forced to confess I once penned a missive comparing Steelers placekickers to ex-girlfriends. And while its a great read, if I do say so myself, who would ever dream of writing a similar article about Steelers linebackers? But if we can quibble over whether placekickers are legitimate football players, the Steelers 2017 season reinforced the crystal clear reality that quality place kicking makes a legitimate difference in the outcomes of football games. That’s a lesson everyone much remember as popular Pittsburgh place kicker Chris Boswell reaches restricted free agency, and the Steelers braintrust decides his future in the Steel City. Speaking of popular Steelers kickers, Shaun Suisham sure was one of them, after taking over for the once-popular–and just released–Jeff Reed midway through the 2010 season. In four-plus years in Pittsburgh, Suisham connected on 87.9 percent of his field goals attempts. Unfortunately, exactly one year after signing a contract-extension, Suisham was lost for the 2015 campaign with a torn ACL suffered in the Hall of Fame Game against the Vikings. After a couple of veteran replacements didn’t work out–including Josh Scobee, who came to town via trade in late August–Boswell won a tryout following Scobee’s release just four weeks into the ’15 season. An undrafted free-agent out of Rice in 2014, Boswell spent time on the practice squads of both the Texans and Giants before landing on Pittsburgh’s active roster. Boswell proved to be an accurate replacement right from the start, connecting on 29 of 32 attempts during his rookie season. He also hit the game-winning field goal in the final seconds of the wild, wild-card win against the Bengals, giving the Steelers their first playoff victory in five years. Boswell wasn’t as accurate in 2016, making 21 of 25 tries, but he was the hero of sorts in the divisional round match-up against the Chiefs, providing the only offense with six field goals in an 18-16 victory. Last season was Boswell’s finest so far, as he connected on 35 of 38 attempts, and was fourth in the NFL with 142 points. 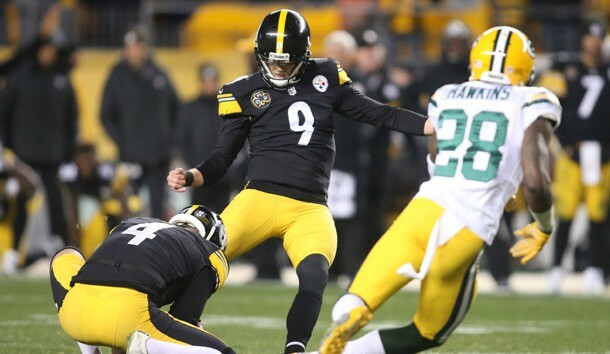 Boswell’s highlights included four-straight game-winning field goals–including three on the final play–during Pittsburgh’s eight-game winning-streak. Good kickers might not be hard so find in 2018, but the great ones sure are. With an 89.5 career percentage on field goal attempts–including just under 95 percent in 2017–it appears Boswell, 26, is just hitting his stride. Furthermore, Boswell not only has the accuracy, he has the leg, as evidenced by connecting on six of eight attempts from 50-plus yards so far during his career–including a 53-yard game-winner against the Packers last season at Heinz Field, a place that’s notoriously tough on kickers. kickers. According to spotrac.com, Suisham’s contract extension in 2014 included a signing bonus of $2.85 million–a number that’s always prorated over the life of a deal–and a base salary of $855,000 that year. With those numbers in mind, it stands to reason a new deal for Boswell, whose base salary was $615,000 in 2017, shouldn’t cost Pittsburgh much more. It’s certainly possible the Steelers could find a cheaper alternative this summer in a training camp invite. After all, who was Chris Boswell, who was Shaun Suisham, who was Jeff Reed, who were any number of really accurate NFL kickers throughout history before they latched on with a team? Do the Steelers really want to devote such a significant portion of their salary cap dollars to a kicker? Of the many personnel decisions the Steelers will have to make this spring, the contract status of Boswell is probably at the bottom of the list, and that’s because it’s a no-brainer. The Steelers should certainly offer a restricted free agent tender Chris Boswell and, ideally, Kevin Colbert should offer him a long-term contract to keep him kicking in Pittsburgh for a long time. This entry was posted in Steelers 2018 Free Agent Focus, Steelers 2018 Off Season and tagged Chris Boswell, Gary Anderson, Jeff Reed, Josh Scobee, Pittsburgh Steelers, Shaun Suisham, Steelers free agents. Bookmark the permalink. What Should The Steelers Do With Restricted Free-Agent Anthony Chickillo?